ST. PUCCHIWhat is a Bustle? If you’re just starting out on your wedding dress shopping and deciding what to wear for your walk down the aisle - whether to opt for a dress with a train or no train, how exactly one is supposed to handle so much fabric trailing behind and yet be able to move and dance, then you probably have no clue what a bustle is, or what to do with a dress that has a long train. “By the end of the 1870s, hooped skirts were no longer stylish, and fashionable women opted instead for gowns with elaborate bustles. A bustle is the name given to the art of drawing up the train so that the gown can become floor-length and allow the bride to move around after the ceremony with ease and avoid tripping. It also ensures that the gown does not drag around on the ground after the ceremony and get soiled. To accomplish this, the train can be pinned up and secured by hidden hooks on the back of the dress. A bustle is useful when the bride chooses a dress with a train. 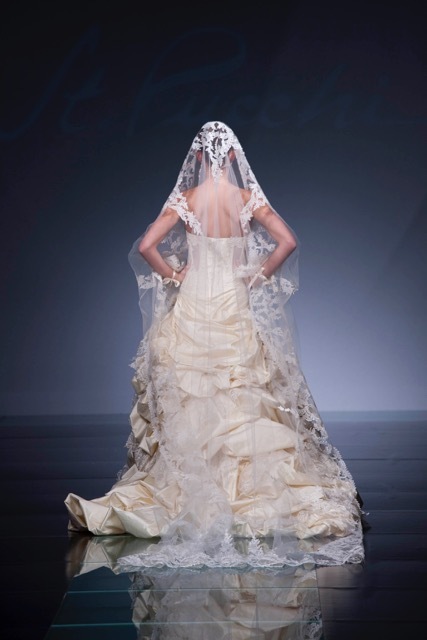 Many brides love the formality of a wedding gown with a long train, but it can be cumbersome at the reception. Assuming that the bridal gown you have purchased has a train, it will need to be bustled after the ceremony and before the reception, resulting in a floor-length dress that is easier to walk and dance in. All dresses with trains from the smallest sweep to the grandest cathedral can benefit from a proper bustle. Depending on the length of the train, a dress can be bustled by lifting and tucking the extra fabric underneath or over the skirt. Larger trains may need to be folded up using a system of hooks. A bustle is a unique and amazing creation that not only serves a practical purpose, but also adds tremendous style and interest to the bridal gown. Rani St. Pucchi is an award-winning Couture Fashion Designer, a Style & Image Consultant, and a Relationship Expert. She is a Bestselling Author, a Speaker, an Inspirational Coach and a Trainer. Her recent TEDx talk: Is Your Body Image Holding You Back has received worldwide acclaim. Rani’s #1 International Bestselling Books, Your Body, Your Style: Simple Tips on Dressing to Flatter Your Body Type ; The SoulMate Checklist: Keys to Finding Your Perfect Partner; and Your Bridal Style: Everything You Need to Know to Design the Wedding of Your Dreams are available on Amazon and at Barnes & Nobles.